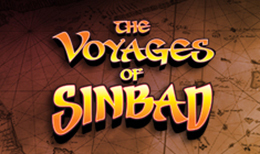 Sail the seven seas with Sinbad and his merry men acquiring real gold cash as you go with this 5 reel 20 payline slot adventure. Encounter dragons and hawks while sieging castles for treasure. Join the adventure with a maximum stake of 10 pence. You can also see our homepage for more info. 2x2 Gaming are a US based designer and developer of innovative video slot games for land-based and digital casinos all over the world. With well over a century of experience in creating titles for the industry within their exceptional team of designers, they specialise in delivering games that keep people engaged and entertained for as long as possible. Based in Chicago, they regularly create custom content for their ever-expanding client base. When the stories of Sinbad were first told is up for historical debate, but what is certain is that his name and his journey carry a certain legacy – that of legend. And the latest title in Sinbad’s legacy comes from 2x2 Gaming, who have created an exciting 5 reel, 20 payline online slot game that takes the tales of Sinbad’s epic travels to the quick-spinning fun of online casinos. From a light-trek in the countryside bet of £ 0.10, to a more epic investment of £20.00, this adventurous slot can deliver magical rewards to those of us who dare to take a chance on its quickly-spinning, highly detailed reels. Sinbad himself, who is the Wild, Scatter, and Free Spins symbol of the game, is joined on the reels by a variety of exotic treasures and delights discovered and plunged upon his travels. Several of his legendary foes also take to the reels, and the variety of symbols make for some significant variety in the visuals – which will come to life when we land winning combinations. Among the other symbols are an Eagle, a Minotaur, an Ogre, Gold Coins, a Golden Compass, an exotic Temptress, a Seahorse, and a Ship – each of which triggers its own smaller value wins, but when used in combination with the Wild will inevitably make for some higher rewards. When we land three of the Sinbad symbols, we are awarded an instant 12 Free Spins. During this feature, one symbol will become a Mystery Scatter, and the opportunity to trigger additional Free Spins is actually endless! This bonus makes for some great variety in the playability, and when the wins do start to pile up, the detail in the visuals and animations make for some vibrant, engaging imagery to enjoy – in addition to the reward in our jackpot! With adventure never far away in this fast-paced online slot game, 2x2 have created a wonderful homage to the legendary character. Whether fictional, mystical, or real – the legacy of Sinbad continues! 2x2 have created an exciting, engaging environment in which to enjoy a few adventurous spins. While the quality of the sound effects doesn’t match the visuals, the gameplay remains at a consistently high level of fun, and the regular rewards dished out by the variety of detailed symbols make for an array of ways to win. With a 2000 coin jackpot on offer in Voyages of Sinbad, Dream Jackpot give it a commendable 8/10 for online gaming fun. Feeling Lucky Try our another variety of Slot Game here.